I still haven't found a way to watch and enjoy NBA basketball, though there was one phase where I was an authority on the great 1980's rivalry of the Los Angeles Lakers and the Boston Celtics. Okay, so I didn't understand the cultural significance of the rivalry. Perhaps I still don't. The Celtics, led by two white guys (Larry Bird and Kevin McHale), played for Catholic pride in the birthstate of basketball against the Lakers, led by the cocaine flash of Magic Johnson and Lew Alcinder (AKA Kareem Abdul-Jabbar). There has been much written on the politics of this rivalry, Chuck Klostermann's essay '33' among the best (though whoever wrote the Lakers-Celtic Rivalry wikipedia article did a hell of a job too). 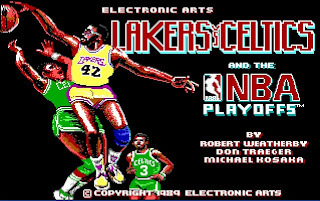 But little, if anything, has been written on the significance of the video game Lakers versus Celtics, a video game I spent hours playing on my Tandy 1000 in 1990. Born of necessity (my Nintendo was broken and I suspect my Mom had sabotaged disk two of Leisure Suit Larry III: Passionate Patti in Pursuit of the Pulsating Pectorals), Lakers versus Celtics was my first flirtation with the sedentary lifestyle I regularly now practice of sitting in front of a computer for hours. Grade seven was not a stellar academic year for yours truly. I actually failed grade 7 art. This is, in part, due to the hours I spent on this video game when I probably should have been, I don't know, making a collage. But to me, Lakers versus Celtics was all the art I needed. Just look at all those colours as Magic lines up for a free-throw. Also note the awesome detail of Kareem Abdul Jabar's goggles (yellow number 33). Computers were still a mystery. 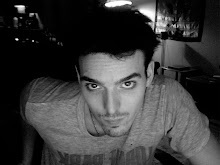 Good for little more than pretending I was going to write a novel or playing video games. In 1986, Ferris Bueller changed his attendance records from home; in 1990 Screech created a fully functioning Robot named Kevin. But the idea of a computer functioning externally was not on my radar. The solitary and private intimacy of playing Lakers versus Celtics was akin to reading a book (did I mention grade 7 was not a stellar academic year?). This might not seem like much now, but this was the first video game I remember with real players. Actually, this still might not seem like much. 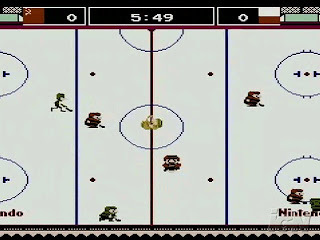 But these were the days of Nintendo's Ice Hockey where the most identity a player had was to be Fat - Skinny - Medium (and from one of six countries, including, if the following picture is correct, Poland).